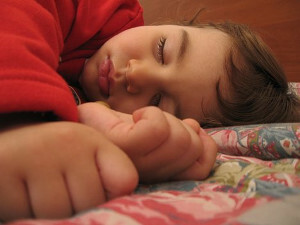 Parents of autistic children often struggle to get them to sleep, and therefore struggle with their own sleep as well. However, we all know the importance of ensuring children get the sleep that they need in order to get the most out of the various therapies and efforts being made to improve their symptoms. However, it can be easier said than done! Over-sensitivity to stimuli can be a frustrating challenge for both autistic children and their parents. Over-reaction to various sounds in the child's environment, as well as smells, lights, or any other sensations may make it difficult for a child to fall asleep or stay asleep. Many autistic children have sensory issues within their sleep environment. This can make it difficult for them to relax enough to fall asleep or to find a comfortable position in which to sleep. In Siegal's book The World of the Autistic Child, it was suggested that the sleep problems faced by autistic children may also be a result of the way autistic neurotransmitters in the brain function. It stated that about 56 percent of autistic children struggle with sleep-related issues that they will rarely "grow out of". So one of the first steps for remedying the lack of sleep is to try to identify what is causing your child to struggle to sleep. Is it anxiety, sensory issues, medical issues, attention seeking, or something in the bedroom itself? 1. Set a bedtime and stick to it, including the routines that occur before bedtime. This allows the child to experience a degree of consistency and predictability, which is often vital to an autistic child's proper functioning. 2. Provide your autistic child with visual rules that indicate the rule for staying in one's room or bed at night. These visual rules should be posted in various visible areas of the bedroom. 3. Pair the bedtime rules and routines that you create with social stories that can help to speak to your autistic child's sleep-related anxieties. 4. Change the bedroom environment to make it more appealing to your autistic child. While some autistic children respond well to having a nightlight, others require total darkness with a black out blind over the window for blocking the exterior light as well. Many autistic children sleep better when their bed is pushed up against the wall, as they feel more secure; a corner is even better. To block out any sounds that may be distressing your child, use a white noise machine or run a fan in your child's bedroom. 5. If you usually sleep in the same bed as your autistic child and he or she is struggling to sleep alone, "replace" yourself with a sleeping bag or body pillow to mimic the pressure that would usually exist if you were lying in the bed. 6. Use layers for your child's pajamas and tuck him or her in well so that any tactile sensitivity will be minimized. 7. By rooting out any disturbances causing your child not to sleep and by introducing routines and an effective sleeping environment, your autistic child should be able to enjoy a great deal more sleep - as will you. Grab your free copy of Rachel Evans' brand new Autism Newsletter - Overflowing with easy to implement methods to help you and your family overcome autism sleeping challenges and for information on effective autism strategies please visit The Essential Guide to Autism.